Daniel Loh: US Stock/ Options Tip - Netflix (NFLX) back from Dead with marvellous earnings! US Stock/ Options Tip - Netflix (NFLX) back from Dead with marvellous earnings! 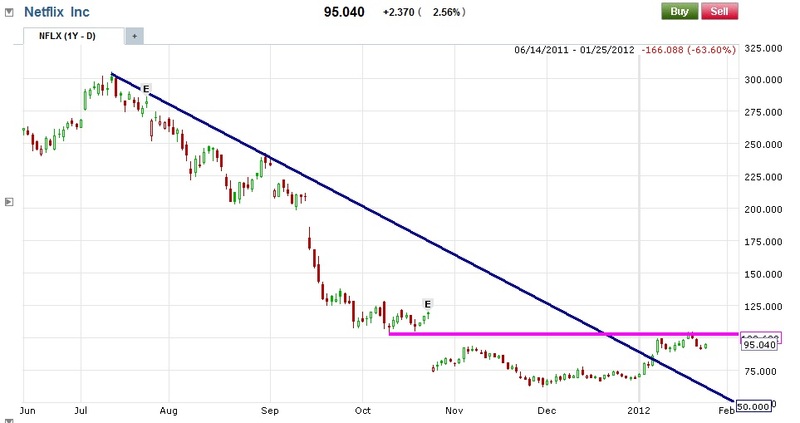 NETFLIX (NFLX) the once darling of Wallstreet, which rises from $50 to $300 within 2 years. However because of an incorrect decision to increase rental of DVD subscription which leads to 2 quarters missing its Earnings estimates, it came tumbling down to $60 in 7 short months. Pls see the chart on where the Letter "E" is. They are the earnings day. See the Gap Down?? This is what I discovered trading US stock. 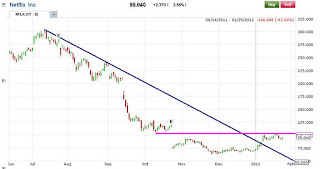 For a strong growth stock like Netflix, normally after 2 quarters miss, it has a HIGH chance of beating the 3rd. This is what I termed "3rd time Lucky" stock. Recently I posted a stock TIP on Goldman Sachs. It suffered the same fate after missing 2 consecutive earnings estimates. For Netflix, this stock is back from the dead. We can play this stock again and again this quarter after it breakout or when it is at the bottom of the box. Today it gaps up. Might open at $107. After consolidating, it will continue its ascent to $125. Remember to sell at $123 if it reaches this target! For options players, you may also play straight call ITM options again and again upon breakout! What is the strategy for STI now? US Market this week: Get Ready for Thursday! Will STI reach 2910 & Dow reach 12700?